A brand new saga of magic and adventure by #1 New York Times best-selling author Brandon Sanderson. On the planet of Taldain, the legendary Sand Masters harness arcane powers to manipulate sand in spectacular ways. But when they are slaughtered in a sinister conspiracy, the weakest of their number, Kenton, believes himself to be the only survivor. With enemies closing in on all sides, Kenton forges an unlikely partnership with Khriss -- a mysterious Darksider who hides secrets of her own. White Sand brings to life a crucial, unpublished part of Brandon Sanderson's sprawling Cosmere universe. The story has been adapted by Rik Hoskin (Mercy Thompson), with art by Julius Gopez and colors by Ross Campbell. Employing powerful imagery and Sanderson's celebrated approach to magical systems, White Sand is a spectacular new saga for lovers of fantasy and adventure. I was super excited to see this Graphic Novel on Netgalley after reading Brandon Sanderson's book, The Rithmatist, a while back and it being one of my new favorite fantasy novels. 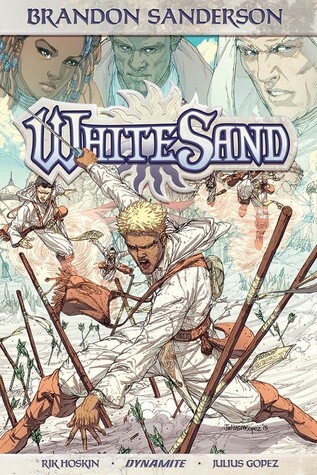 This world of different groups or people with powerful magic systems drew me into reading the book, but I have to say that unfortunately, White Sand didn't quite live up to my expectations. This graphic novel is supposedly set in Sanderson's Cosmere universe in which I have not read any other books of his with this particular world in it. I suspect that if I had, I might have enjoyed this graphic novel more, but unfortunately, that was not the case. The world itself just from this graphic novel is very elaborate. There are people of different backgrounds, races, and religions along with a well thought out magic system. Of course, I would expect nothing less from Brandon Sanderson, the master at fantasy word building and magical elements. I will not attempt to try and explain this world in detail because I found the information contained in this graphic novel did not allow me to fully understand the world and its elements fully, but I really liked the idea of each aspect of it nevertheless. I think it is important for you guys to know that I am not one who has great luck with graphic novels. I can never really enjoy them as much as I enjoy full-fledged novels, but I had high hopes that this one would be the one. The one that opened my eyes to the idea that graphic novels don't always have to feel as if they are missing something important and can keep me engaged. 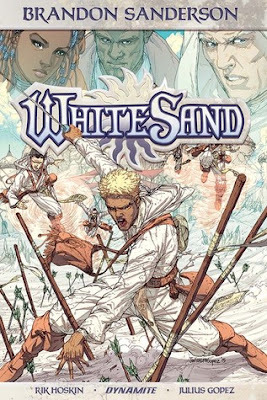 White Sand had all the ingredients and potential with a great world, wonderful fantasy elements, and a great author, yet it still somehow fell a bit flat for me. Some of the characters had the ability to control sand which I thought was awesome and gave me a The Last Airbender vibe. Their powers are great but still limited. There are dark and light-siders. We mostly explore the light-sider world in this book, and dark-siders are mostly characterized by their dark skin color. It is easy to tell that the world has its own story behind each of the different groups of people who have their own culture and politics. There are some who worship a sun god and some who are more or less atheist. There were even different languages. Talk about attention to details! There were so many elements and none were explained very closely (at least in this first volume), so I was left feeling like I had missed out on such a great, expansive universe Sanderson has created. Once again, maybe having read one of his other novels set in this world would have remedied all of this. As for the artwork, I did not particularly enjoy it, but I feel like I cannot fairly judge it by just reading the eARC format I received from the publishers on Netgalley. In this format, most of the pictures were blurry and not well detailed, but I am sure they look ten times better in the finished copies. I probably would have had a better reading experience if the artwork had been clear and finalized as the artists and publishers envisioned it. Overall, this was a book that had a lot of potential, but I think I expected too much before actually jumping in. I do have to say that it was still a great read and I'm sure those who read the finished versions will enjoy it much better. It was also good enough to have me wanting to pick up the next graphic novel in this series or one of Sanderson's other books written in this universe.